Here are the most commonly asked questions by homeowners about EIFS. We are pleased to offer our perspective in the responses provided to each question. If you have a specific question that is not directly addressed below, feel free to submit it through our contact form and we will be happy to respond as quickly as possible. How do I know if my home is finished with a true EIFS? How do I know which manufacturer’s EIFS product is on my home? Can I identify the EIFS brand from its mesh colour? Can I repair an EIFS myself? The EIFS is leaking. How do I inspect it? What is involved with removing and replacing an EIFS? I have a barrier-type EIFS on my house and would like to add a drainage-type EIFS to it. Is this possible? How can I tell if I have the newer drainage-type EIFS? My EIFS has dots or spots all over it. What is causing this? How do I repair leaky windows? Can I paint my EIFS? There is a hole or a depression in my EIFS. Can it be repaired by applying basecoat and finish into the damaged area? How long does an EIFS last? Is there a difference in quality between EIFS brands? If I am buying an existing EIFS home should I have an EIFS inspection done? We are building a new EIFS home. What are the most important points that we should consider? Our home is stucco with some EIFS foam shapes on it. Our insurance agent is appraising the property as if it were an EIFS home. Is this an acceptable practice? When is the use of drainage EIFS required? 1. How do I know if my home is finished with a true EIFS? To determine if your home is finished with a proper EIFS, you can try to carefully rap on it as you would a door. If it sounds hollow, it is probably an EIFS. If the sound is more solid in nature, it is likely a plaster stucco product. Should the feel of the wall have a very coarse texture, this would be another indicator that a stucco product has been applied. It is important to note, however, that EIFS coatings can also be applied without insulation directly onto hard sheathing boards, like cement board. Rapping on this type of application will also produce a solid sound, similar to stucco. 2. How do I know which manufacturer’s EIFS product is on my home? It can be difficult to determine which brand of EIFS has been installed, as most brands of EIFS look the same. You can try contacting the general contractor who built the house, or the contractor who installed the EIFS, if you can obtain their contact information – they may recall which brand of EIFS was installed on your home. Do not be accepting of/satisfied by what was written in the building specifications since they will often cite a certain brand while another brand is actually installed. 3. Can I identify the EIFS brand from its mesh colour? 4. Can I repair an EIFS myself? EIFS is not a do-it-yourself product. 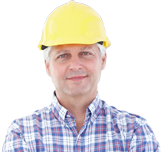 It is recommended to hire a certified EIFS contractor. 5. The EIFS is leaking. How do I inspect it? Customarily, the EIFS itself does not leak. Leaks almost always occur at the edge of the EIFS, either at an opening (such as a window), a penetration (like a deck beam), or at a flashing/sealant joint. Regarding self-inspection, you can do a quick visual examination for obvious flaws, such as cracks or the lack of caulking, but detailed assessments are best left to professional inspectors. 6. What is involved with removing and replacing an EIFS? An EIFS is removed by carefully cutting away the entire system, including the foam, back to the supporting wall. The old EIFS cannot be reused and must be discarded. The supporting wall is then inspected for damage and any requisite repairs are done – this could involve removing studs and/or sheathing, which can be an extensive process. The new EIFS is then applied over the repaired wall and is blended into the surrounding EIFS, if and as necessary. 7. I have a barrier-type EIFS on my house and would like to add a drainage-type EIFS to it. Is this possible? Regrettably, it is not possible to add a drainage-type EIFS to an existing barrier-type EIFS. To add drainage, the existing EIFS would have to be removed and replaced completely with the new drainage-type EIFS. 8. What is the difference between EIFS and Stucco? EIFS may come in several different types, but the typical installation includes the substrate, a polystyrene foam board fastened/glued to the substrate, fiberglass reinforcement mesh, a basecoat (usually 1/16 to 1/4 inches thick) and then a finish coat. On the other hand, stucco is portland cement plaster. The stucco assembly usually includes a substrate over the framing members with a moisture barrier present, self-furring metal lath, cement plaster basecoat, and lastly a hard-coat finish. Both systems have advantages and disadvantages. 9. How can I tell if I have the newer drainage-type EIFS? Drainage-type and barrier-type EIFS look virtually identical from the outside, but you may be able differentiate them by looking under the horizontal edge of the EIFS where it comes to an end, such as at the top of a window or at the bottom of the wall close to the ground. A drainage-type EIFS will have some sort of gap, flashing, or a perforated piece of metal or plastic trim, to route water from the drainage cavity to the outside. However, the presence of such a gap is not a foolproof indicator, as some barrier-type EIFS also incorporate this feature. Cutting through the EIFS to check for building paper between the foam and the sheathing is also not a reliable method, as some barrier-type EIFS also incorporate a paper layer. The paper alone does not produce a true drainage cavity. Once again, it would be worthwhile to hire an experienced contractor to inspect the EIFS. 10. My EIFS has dots or spots all over it. What is causing this? A lot of residential EIFS are attached to the supporting wall using mechanical fasteners. These fasteners consist of a large plastic washer and a metal screw. The washer sits on top of the EIFS insulation and is covered by the EIFS coatings. The washer is thus just a fraction of an inch from the outside air. Since the fastener is made of metal and plastic, the washer will be at a different temperature than the surrounding layer of EIFS insulation. This temperature disparity means that the EIFS coatings retain a different amount of moisture at the fastener than within the surrounding wall. This in turn makes the EIFS finish look like it is a different colour, hence the wall appears to have dots or spots on its surface. The dots/spots rarely do any harm and usually disappear as the wall’s temperature becomes more consistent throughout, such as during the middle of the day. This phenomenon is unavoidable, but may be reduced by applying a thick initial EIFS basecoat to even out the temperature of the EIFS surface, thus reducing the dotting effect. 11. How do I repair leaky windows? If the leak is actually in the interface between the EIFS and the window, a simple solution such as adding caulking to seal the leak will often be effective. If the leak is coming from the window itself, this sometimes can be repaired with the window in place or the window may need to be replaced entirely (often the case when the window frame is old and rotted). Removing a window from an EIFS wall can be difficult, as many residential windows use a nail flange to mount the window to the face of the wall sheathing, preventing the window from sliding out of its opening. It is advisable to hire a professional in these circumstances. 12. Are EIFS repairs visible? With expert workmanship, repairs will be hard to detect, especially if they extend back to a nearby corner or joint. Normally, though, the patch will be visible right after it is done. As the wall ages, the patch blends in and becomes less visible. 13. Can I paint my EIFS? Yes, you can paint over EIFS treatments in general; however some EIFS finishes will contain additives that make it difficult for the paint to adhere. It is best to contact the specific EIFS manufacturer to ask which paints will work on their various finishes. Luckily, most EIFS formulas are pure acrylic, which means that basic exterior grade acrylic house paints will work just fine. In any event, it may be wise to perform a small test on an inconspicuous area of the EIFS, letting the paint dry for several days to see if it remains bonded. Paint is usually applied with a roller on large flat areas of an EIFS while a brush is used in small or intricate areas, such as around windows and in grooves. 14. There is a hole or a depression in my EIFS. Can it be repaired by applying basecoat and finish into the damaged area? No, simply plugging a hole in the EIFS with basecoat and finish will not be sufficient, as the so-called plug will eventually fall out. The best way to repair a hole or a depression properly is to cut the EIFS away (back to the substrate) and apply new foam and coatings to the new insulation. EIFS manufacturers often provide photos/written instructions of how to proceed, but having a professional EIFS contractor perform the repair will ensure the best result. 15. How long does an EIFS last? The lifecycle of an EIFS system depends on how well it was initially installed and how well it has been maintained over time. An example of the required maintenance includes replacing the caulking, which will eventually wear out and lose its effectiveness. There are some older EIFS projects dating back to the 1950s in Europe and to the late 1960s in North America that remain in very good condition today, occasionally requiring just a fresh coat of paint to freshen their appearance. 16. 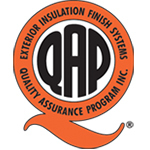 Is there a difference in quality between EIFS brands? Since each EIFS manufacturer has its own formulation/composition, there will definitely be a difference in quality between the various brands. Within the product line of a given brand manufacturer, there are often various grades of EIFS as well, with the higher quality grades usually sold at higher price points. However, the quality of an installed EIFS system is just as dependant, if not more so, on the installer. 17. If I am buying an existing EIFS home should I have an EIFS inspection done? Yes, it is always a good idea to have an existing EIFS inspected by a professional when you may have concerns about the condition/state of repair of a particular installation. While an EIFS installation may look fine, most problems are hidden below the surface. A professional inspection will assess the present value of the installation as it relates to the overall value of the home, and also give the buyer and the seller, as well as realtors and insurance agents, a good level of comfort. 18. We are building a new EIFS home. What are the most important points that we should consider? 19. Our home is stucco with some EIFS foam shapes on it. Our insurance agent is appraising the property as if it were an EIFS home. Is this an acceptable practice? From a functional standpoint, the house in question is considered to be a stucco house if the base walls have a stucco finish, regardless of any EIFS applied over them as a decorative trim. In such cases, the EIFS is used simply to enhance the aesthetics of the home and has little effect on the performance of the wall. 20. When is the use of drainage EIFS required? The use of a drainage-type EIFS is dependent on the local building requirements, and is also heavily reliant on local climate. It is at the discretion of each homeowner to determine if drainage is a necessary feature in the particular EIFS installation for their home. 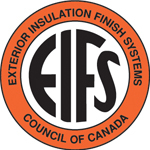 Consult with the EIFS manufacturer or local homebuilder for advice pertinent to your specific region.